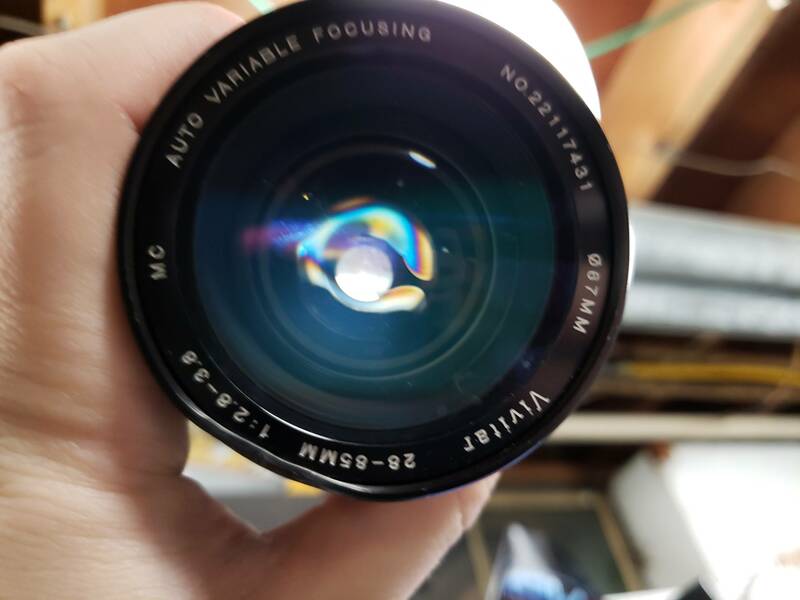 What is this colorful 'C' shape blemish in this old Vivitar 28-85/2.8-3.8 lens? What is happening with this lens? Bought in a box of used lenses. Clearly it has met with some abuse, but I'm not familiar with what's actually happening. It has this colorful 'C' shape somewhere inside of it. Hard to tell what it is without examining the lens in person. Could be something benign, like lens coatings, or something impossible to fix, like balsam separation. Based on the age, type, and manufacturer of the lens, I suspect it could be oil on a lens element. 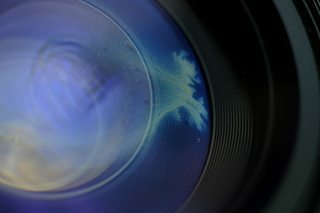 Supporting evidence would include a "greasy" appearance and "sticky" aperture. The problem can be fixed with a CLA (clean, lube, adjust). If the lens works fine as-is (probably not), I'd consider leaving it alone if the affected element is deep within the lens. It's an old zoom with clear damage that may not be worth the cost to fix. If you try to clean it yourself, you risk being unable to reassemble it because old zoom lenses can be difficult to reassemble. Disassembly of lenses made by Kino Precision is complicated by parts that are unnecessarily glued together. How to identify the original manufacturer of lenses branded Vivitar? How to set up a safe environment to clean inside an old lens? Is this vignetting from my zoom lens or something else? What is the Canon PE Mount?